Hard lines and soft texture are the defining point for this new kitchen for a client in Sydney's North. Created using a combination of our innovative Axolotl concrete surfaces on the benchtop and splashback it's easy to see how much potential is realised when shrugging off the constraints of traditional concrete construction. The end result is original and simple in its execution, but exudes contemporary design in one of the most important rooms in the home. 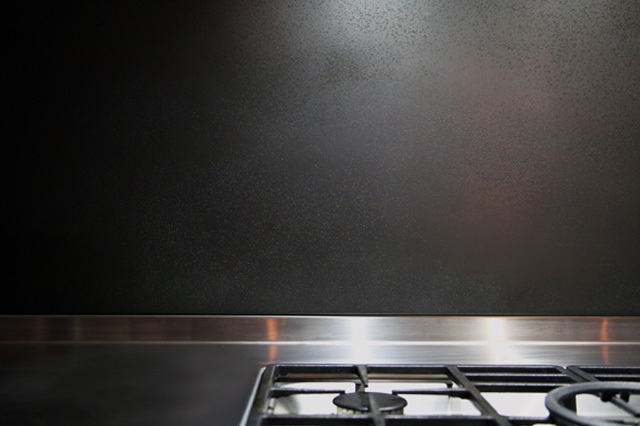 The splashback has been created by taking a single CFC sheet and bonding it with Concrete Slate in a lunar texture. The same process is used to create the bench, with the vertical surface featuring an abstract design carved directly into the MDF before the Concrete Shale is bonded. The simple execution of these finishes truly portray the versatility of the Axolotl Concrete range whilst retaining the beauty and integrity of solid concrete. Published on August 20, 2013 by axolotlblog.